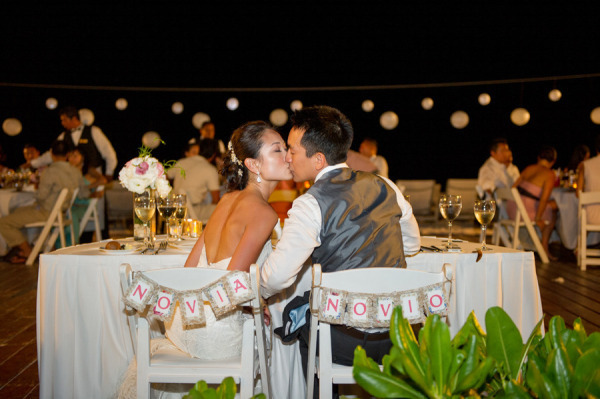 Wedding Wednesday: Dreams Riviera Cancun Featured on Style Me Pretty! As we always say, we love hosting weddings at Dreams Resorts & Spas! A recent wedding at Dreams Riviera Cancun Resort & Spa was particularly beautiful – it was even featured on Style Me Pretty, the ultimate wedding blog. The bride and groom laced romantic symbolism throughout the entire ceremony, which made it a very touching experience. “Wedding colors were chosen based on the colors found inside of a conch. Light peach, pinks, nudes and crème. We kept our ceremony décor simple and clean to keep the focus on the beauty of beach,” said the bride, Betty. The couple also incorporated black and red sand into their wedding ceremony that they collected from beaches they visited during their engagement trip to Oia, Santorini in Greece. 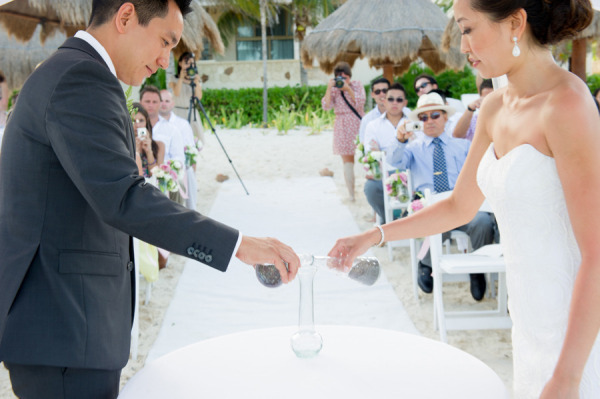 “Once we decided to have our wedding in Mexico, it became important for us that we used the sand from our engagement destination for the sand ceremony at our wedding destination,” explained Betty. The way they emphasized the natural beauty of their wedding location and tied the ceremony to their romantic past made this a truly beautiful wedding. Congratulations, Betty and Nelson! To read the entire blog post on Style Me Pretty please visit here! This entry was posted in Dreams Resorts & Spas, Dreams Riviera Cancun and tagged Dreams Resorts & Spas, Dreams Riviera Cancun, Dreams Wedding, real weddings. Bookmark the permalink. I’m excited to discover this web site. I need to to thank you for your time for this wonderful read!! I definitely liked every part of it and I have you bookmarked to look at new information on your blog. What’s up, I log on to your new stuff regularly. Your writing style is witty, keep it up!